Voor ieder die met dieren wil gaan werken, met name wilde dieren, is praktijkervaring heel belangrijk. Er moet veel aandacht aan besteed worden, aan theorie alleen heb je niets. Dieren blijven dieren. Ze kunnen koppig zijn en hebben een eigen wil. Je weet dus nooit zeker wat hun volgende stap is. Door te werken met dieren in de praktijk kun je leren om hun gedrag te lezen en herkennen, zo kun je in vele gevallen hun volgende stap enigszins voorspellen en daar op de juiste manier op reageren en mee omgaan. Als gewerkt wordt met wilde dieren kan dit zelfs je leven redden. Natuurlijk kan iedereen concluderen dat, wanneer een bizon met zijn kop omlaag op je afgestormd komt, deze niet veel goeds met je van plan is. Maar gedrag van dieren gaat veel verder en is veel ingewikkelder dan dit. Neem bijvoorbeeld een wolf. Een wolf lijkt veel op een hond, maar ze verschillen van elkaar als dag en nacht. Bij het werken met wolven is het zeer belangrijk om te weten hoe zij zich voelen en hoe je je moet gedragen. Dit is mijn verslag over mijn ervaringen op Wolfpark. Voor de studie Diermanagement moest ik aan het einde van het eerste jaar op een dierverzorgingsstage van vier weken. Het is een fantastische ervaring geweest en dat heb ik voornamelijk te danken aan mijn collega stagiaires en de medewerkers van wolfpark. Wil ik graag bedanken voor deze prachtige ervaring. Verder wil ik ook het Van Hall Instituut bedanken, zonder hen had ik dit adres nooit kunnen vinden. De twee mensen die ik het meest dankbaar ben zijn Lex en Joke Segers. Zij hebben veel tijd gestoken in het regelen van mijn vliegticket, visum, geld en alles wat kwam kijken bij mijn reis. Zonder hen had ik dit alles niet kunnen doen. Wolfpark is a non-profit organization founded in 1972 by the German ethologist Dr. Erich Klinghammer. 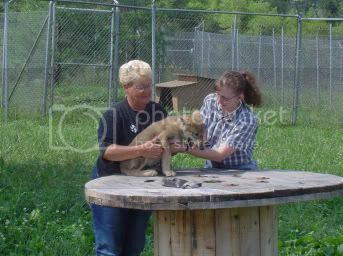 In this same year Wolfpark got its first two wolfs, Koko and Cassie, from the Brookfield zoo in Chicago. Wolfpark now has 14 adult wolves, 4 wolf puppies, 4 red foxes, 2 New Guinea Singing dogs and 25 bison. The park gives tours all week round and has several lectures going on during the weekends. To raise money, the park offers a wolf adoption/sponsor program. For a certain amount of money people can adopt a wolf and pay him or her a visit. Further more, Wolfpark has other things like special kids programs going on to educate and raise money. So the park fully relies on gifts, donations and admission fees. Wolfpark also relies on the work of Interns who keep the park clean, mow the grass, give tours, run the giftshop, feed the wolves etceteras. During my four week internship at Wolfpark I learned more than I could learn during a year of reading books about it. I now have had practice experience with working with wolves. It's hard work to run Wolfpark, but it's also fun work. A list of the work that needs to be done: feeding, butchering, cleanup, foxtalk, running the register, giving tours, doing crowd control, weed whacking, helping with kids programs. Wolfpark is een organisatie zonder winstbejag dat is opgericht in 1972 door de Duitse gedragskundige Dr. Erich Klinghammer. In ditzelfde jaar kreeg Wolfpark haar eerste twee wolven, Koko en Cassie, van de Brookfield Zoo in Chicago. Wolfpark heeft nu 14 wolven, 4 wolven pups, 4 rode vossen, 2 New Guineau Singing dogs en 25 bizons. De hele week verzorgt het park rondleidingen en tijdens het weekend worden er lezingen over de dieren gegeven. Om geld op te halen bestaat er de mogelijkheid om een wolf te adopteren. Voor een bepaald bedrag per jaar kunnen mensen een wolf adopteren en mogen deze dan op afspraak een persoonlijk bezoekje brengen. Verder verzorgt Wolfpark ook speciale educatieve programma's voor kinderen waarmee zij ook geld ophalen. Het park is dus volledig afhankelijk van giften, donaties en toegangsgeld. Wolfpark vertrouwt bijna volledig op het werk dat stagiaires verrichten. Zij houden het park schoon, maaien het gras, geven tours, werken in de souvenirwinkel en voeren de dieren. Tijdens mijn vier weken op Wolfpark heb ik meer geleerd dan ik in een jaar uit een boek zou kunnen leren. Ik heb nu praktijk ervaring in het werken met wolven. Het is hard werken om Wolfpark draaiende te houden, maar bovenal is het leuk werk. Een opsomming van het werk dat gedaan moet worden: voeren, opruimen, kassawerk, rondleidingen geven, grote bezoekersaantallen in bedwang houden, gras maaien, helpen met kinderprogramma's. I have always been very interested in animal behavior and ethology. I also love traveling, seeing something of the world and learn how it is to work there. Therefor I wanted to spend my internship somewhere outside of the Netherlands and where I could get experience in working close with animals. I have always wanted to go to the United States of America, not only to see the difference in rules and legislation for animal parks, but also to see how life is different from living in the Netherlands. I soon found Wolfpark in the school files. It immediately caught my attention because of how close I could come to the animals. This way I can get experience with how to work with ´wild´ animals and learn a lot about them. And because it is a non-profit organization I am also working for a good cause, I find this a good opportunity to contribute as much as possible. I find it important to educate people about a species that is or was threatened by human. I want to know what it takes to run an animal park with predatory animals and how the animals are kept and taken care have. From June 14th to July 14th I have spent my first year internship of one month at Wolfpark in BattleGround, Indiana, USA. This internship has as aim to get experience with working on an animal park for the study of Animal management. For this internship I have made three ´study goals´. These goals describe some skills I want to work on to improve them and to give them higher quality for work later on. Besides getting experience with working on an animal park, this internship also has as goal to improve my report writing skills. For my internship at Wolfpark I wrote one report which consists of two parts. In the first part, the ´organization report´ (bedrijfsverslag), the park itself will be discussed in detail. Some subjects that will be discussed are the park's history, aims, legislation, nutrition, housing, healthcare and more. At the end of this part of the report everything will be discussed concise in a conclusion. The second part of this report is the ´process report´ (procesverslag). Here, my personal experiences will be described. I will extensively describe how I evolved from beginning to end and what kind of activities I have participated in. This is also the part in which my three intern goals will be discussed. I will describe these goals and discuss how they came to me during my internship. In the conclusion my intern goals will once more be discussed concise. Wolfpark is founded in 1972 by the German ethologist Erich Klinghammer. He first studied pigeons but after he found out that he was allergic to them he chose wolves to be his next subject of study. Dr. Klinghammer had a piece of land near BattleGround, Indiana. With the money he saved he build the first enclosures and he soon got the first two wolves, Koko and Cassie, from the Brookfield zoo in Chicago. Dr. Klinghammer raised money by giving lectures and getting people to sponsor wolves or give donations. In the years that followed the park got an observation building, an education building, a gift shop, an office, a parking lot and more enclosures. The park also got its first two bison and foxes. After a process of breeding and trading animals the park now has 14 adult wolves, 4 wolf puppies, 4 red foxes, 1 coyote, 25 bison and 2 New Guinea Singing dogs. With the growing of the park the number of visitors at the park also grew. Tuesdays to Saturdays there are seven tours a day going around the park given by the interns. Friday and Saturday evenings there is a howl night and on Sundays there is a wolf-bison demonstration, several lectures are going on at the park and there are three tours going around the park. Tuesday to Friday it's often quiet at the park, but in de weekends the park is crowded with visitors. Wolfpark (figure 1) is a non profit organization which focuses on conservation of the wolf population, educating as many people as possible about the wolves, bison and foxes and Wolfpark focuses on research. 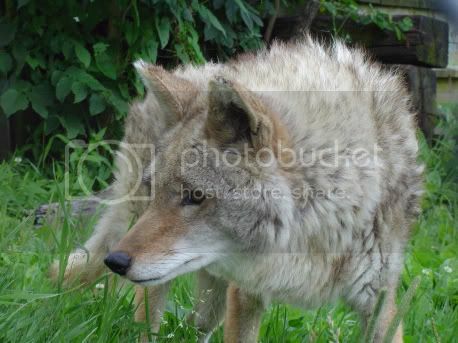 Wolfpark does so by providing the audience daily tours and several lectures. 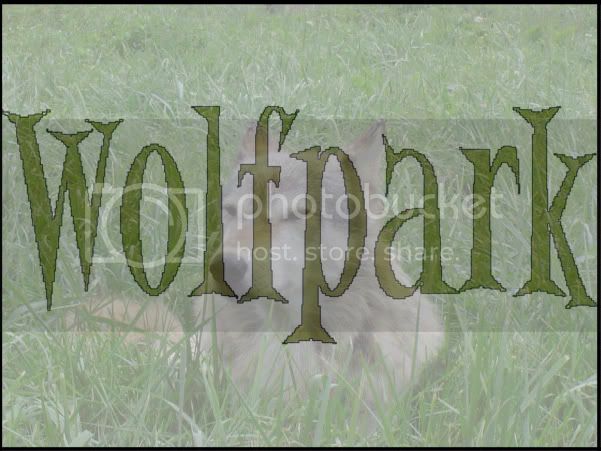 Wolfpark has its own breeding program and by trading wolves the park tries to maintain a stable wolf population. The research of Wolfpark focuses on social behavior, reproductive behavior, predator-prey interaction and work in developing handling techniques for human-wolf interaction. Wild wolves are impossible to be studied intensively. They are so skittish that they will always run and hide from people before we have even noticed them. By studying wolves under semi-natural conditions in captivity, information can be obtained that can not otherwise be collected in wild studies. Wolfpark is not funded by the government. They completely rely on donations and admission money. So the park never really knows how much money they will raise. The average budget for the park is around $350,000 per year. This money is used to maintain the park by building new enclosures, new buildings like an education center, buying the animals their medicine and food like Nebraska brand and dog food, doing research, etceteras. Wolfpark has a board of directors. This is required for a non-profit foundation. The park also has several licenses from the government in order to keep wild animals, such as wolves, in captivity. They also have a license to allow visitors to come to the park. Whenever Wolfpark gets new animals at the park there are forms they have to file with the government telling them that they have those animals legally and where they are going. Before Wolfpark could exist all the people living near the park (mainly farmers) had to agree with the park getting there. All agreed, but one. This caused some problems for the park, but luckily they got clearance from the government and until so far they have proven to handle the job quiet well. A few times in the history of the park wolves have escaped, but no harm to live stock or people was done and the wolves were recaptured or even got back on their own. Most of the staff members are also care taker for the animals at the park. 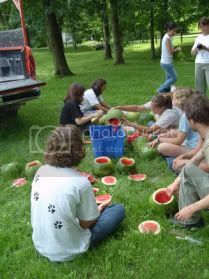 But the park mainly relies on the interns to feed the animals. It is the intern's task to make the meatballs and hotdogs and feed these to the wolves. 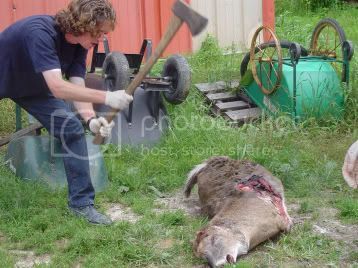 They also take care of butchering the deer and feed these to the wolves. The interns make a schedule for the week. This schedule says whose turn it is to have animal duty. When you're on animal duty it is your task to make the meatballs in the morning and the afternoon, to give the wolves their ice cubes, to refresh the water three times and if it is a Tuesday, Thursday or Sunday to butcher the deer and feed it to the wolves. The only animals not getting fed by the interns are the red foxes and the wolf puppies. Other tasks of the interns are to mow the grass in and outside of the enclosures, to run the gift shop, to give tours, to do crowd control and actually to do everything necessary to maintain the park. Interns can also help out with special programs for kids and interns get to go in with the puppies. This is great fun for the interns and at the same time it helps with the socialization of the puppies. All animals at Wolfpark are hand-raised. This means that there will be someone with them for 24 hours a day, 7 days a week for the first weeks of their lives. This way the animals get used to having people around, they will accept us as being part of the pack and they will not run away whenever they see people. The wolves are in a pack of 3 or 2 wolves and some wolves live alone for safety precautions. There is one large enclosure of about 5 acres where 3 wolves live. This large enclosure holds a little lake with an island and it's filled with trees and bushes for the wolves to hide behind. The ground is almost everywhere covered with grass, which is mowed almost every two weeks. The enclosure also holds a wooden hiding pen for the wolves to seek shelter from the sun, the rain or from visitors. The wolves can drink water from the lake, but they also have a water bucket in the far corner of their enclosure, which is refreshed three times every day. The wolves are fed deer meat three times a week, but they are free to hunt for rodents or other little animals that find a way into their enclosure. This has also given some real interesting situations during several lectures, where one of the wolves ran of to hunt for a rabbit or mouse. The smaller enclosures, where the other wolves, the puppies and the coyote are, vary in size form 90 x 90 feet up to100 x 100 feet. The smaller holding pens are about 40 x 60 feet. All enclosures have some trees and hiding pens for the animals to lie in the shade. They also have a water bucket. To give them something to cool themselves of on they have a filled bathtub to stand in. 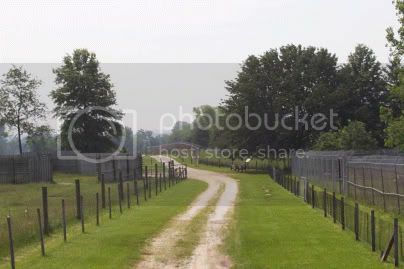 For the safety of the visitors the enclosures are surrounded by a high fence with overhang so that the wolves can't climb out and a second lower fence (figure 2). This way the visitors cannot (or should not) stick their fingers through the high fence. The foxes and New Guinea Singing dogs (figure 3) live in enclosures on the other side of the park. Both enclosures are 60 x 90 feet. The fox enclosure is filled with trees, tree stumps, and little ladders for the foxes to climb in. The ground is covered with grass and sand and on some places there is some chicken wire on the ground so that the foxes can't dig their way out. They have a little fountain where they can get water. The New Guinea Singing dogs enclosure is on the ground covered with grass, there are some logs and bushes in the enclosure. They also have several little shacks where they can hide or climb on. The singing dogs have two water buckets, which are also refilled three times a day. The foxes and singing dogs enclosure both have a chicken wire ceiling so that they can't climb out; especially the foxes love climbing. The biggest enclosure on the park is the Bison enclosure, which is about 40 acres in size. It has its own lake and has a lot of grass, which is also the bison main food. It also has some trees and a rock formation, which is also the wolf cemetery. In one of the corners of the enclosure they have their drinking tub, which is refilled three times a day. The wolves and coyote at Wolfpark get fed deer meat three times a week. Every wolf at the park gets his or her bit; a leg, a rib, a head, a but, a piece of the backbone or the intestines. They also get meatballs or hotdogs with their medicine inside two times a day and in spring and summer the wolves get ice cubes filled with dog kibble in the afternoon. The puppies get a special milk mixture in the first couple of weeks of their lives. After that they get a horsemeat mix with kibble and other important nutrition's dependent on the conditions of the puppies. The puppies of this year (April 12th 2004) had very thin bones in their hind legs. To solve this problem they where all put on a special calcium diet to help getting their bones stronger. The red foxes are also fed deer meat and ice cubes. 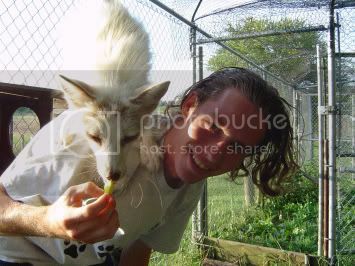 They also get some treats like kibble, bunny's, chickens or peeps during the fox talks (short lectures about red foxes). 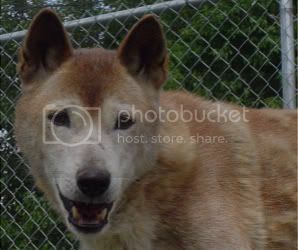 The New Guinea Singing dogs get a mixture of horsemeat, canned dog food and special science diet dog kibble. The bison only get fed apples on Sundays during the wolf-bison demos. The rest of the week they just eat grass. The bison calves also drink mothers milk. On the 4th of July the wolves and foxes got watermelon filled with treats to celebrate Independence Day and with Halloween they get pumpkins. Wolfpark gets its deer meat by deer calls. People in the area who know that the park needs deer, call the park when they find road killed deer or when they have a still born calf. Someone of the park goes to the place and picks up the deer or calf. The dead animals are kept in the freezer at the park (figure 4). Because of the enormous deer population in the area a lot of deer get hit by cars, so the Wolfpark freezer is filled for months to go and deer keep coming in. Sometimes people also donate dead bunnies or chickens to the park. These can serve as treats for the wolves and foxes. Several times a month the local vet visits the park to give the animals their shots, for example, against rabies (figure 5). Because the animals are hand-raised the vet and the staff can go in with them and the animals will even approach them. The vet gives them their shot and the wolves will even enjoy it. As said before, they also get medicine twice a day. Most wolves get cosequin, some also get vitamins, flax oil or rimadyl. Because there are a lot of dead things at the park (deer) sometimes this gives rise to a problem with maggots. 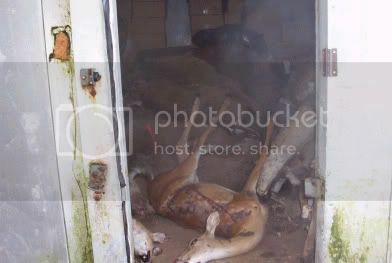 The dead deer are kept in the freezer, but after they are butchered they are kept in the cooler for several hours or days. One time the cooler broke and there where maggots all over the place. The wolves definitely wouldn't mind, it just adds some new flavor to the meat, but for the people that have to feed it to them it is less pleasant. Things like this are hard to prevent and these are not very serious or dangerous issues so it's not that big of a problem, it just takes some time to clean it up. Whenever an animal at the park dies it is kept in the freezer for a while and (if it's a wolf, fox or coyote) buried at the wolf graveyard. If it's a bison it might be used to feed the wolves. Dead deer that have diseases or don't look healthy for the wolves to eat are being put in garbage bags and are thrown away in the garbage container to be picked up later. Butchering a deer is very bloody and disgusting. Butchering interns can wear gloves and after butchering they can take a shower to wash the blood of. 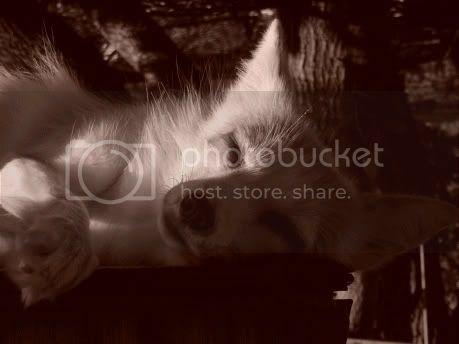 To stimulate the welfare of the animals at Wolfpark they are hand-raised. By hand-raising the animals they have no stress of having people around. Whenever wolves get into serious fights they are being separated. Some are being introduced to other wolf packs while others better live alone for the rest of their lives. Of course when wolves really get into serious fights there is nothing you can do about that, it is the way nature is. But after the fight or whenever there is a change of getting the aggressive or injured wolf out the staff will try so. Lots of wolves already have been taken out of the main pack and put in with other wolves. The wolves are fed pieces of deer. Nothing of the deer goes to waist. Even the skin is fed to them. The deer fur works as floss so whenever the local vets comes in and takes a look at their teeth she always tells the park that the wolves have excellent teeth. Some wolf facility parks take of the skin of the animals before feeding it to the wolves while in nature the wolves eat everything of their captured prey. That is why Wolfpark leaves the skin on. The intestines of the deer are also fed to the wolves, this way the wolves also get nutrition's which they can not get from eating only meat. In the stomach of deer are half-digested plants that are very important for the wolves because they are not very well able to digest plants themselves but they do need these nutritions. Wolfpark breeds its wolves. It keeps some of its puppies and it trades some of its puppies to get new bloodlines into the park. Occasionally the park gets new wolves or foxes from other animal parks. Wolfpark started off as a research center. Dr. Klinghammer gave lectures and classes about wolves and behavior. Nowadays the park gives tours to the public all week round. There are some informative signs but not many. All the information people want to know is to be found during the tours. The parks aim is to educate as many people as possible about wolves and everything that has to do with them. On Saturday and Sunday the staff gives several lectures about howling and hunting behavior of the wolves. There are also lectures going on about the foxes. Wolfpark also has a special kids program. A lot of children participate in this. They get to go in with the foxes, the puppies and the bison. They play several games related to wolves, bison, coyotes, foxes or dogs. Like clicker training and radio collar tracking. The gift shop has some very interesting books about wolves, foxes and bison. And in the library are many books for the interns to read. The education building is open to the public. Here all kinds of educational things can be found. The weekly program and the special event program can be found on the Wolfpark website. There is also a possibility to sign up for the Wolfpark newsletter or the Wolfpark for kids mailing list. During my four weeks at Wolfpark I have learned a lot about the park. The park has a lot of rules from the government to follow. All animal facilities have this, but with predatory animals such as wolves the government has even more and more strict rules. The park needs a board of directors and several licenses from the government. They have a license to allow visitors to visit Wolfpark and they have several forms to fill out when the park gets new animals. After the park has vested the right to ´exist´ the park needs to be run. Wolfpark is a non-profit organization, so it needs all the help it can get. That is why Wolfpark is mainly run by interns and volunteers. It gets its money from gifts, donations, entrance fees, lectures and special programs. The park is now working on getting a cast out wolf (Eclipse) back that was born at Wolfpark, but moved to another animal park. The park does so by letting people adopt her with discount and by washing cars and organizing roller skate events for only a small donation per person. I really admire Dr. Klinghammer and the Wolfpark staff for their tenacity and hard work. It's not easy to run a non-profit organization like Wolfpark. Hieronder behandel ik mijn stagedoelen. Twee van de drie hebben te maken met spreekvaardigheid en de ander is een persoonlijke vaardigheid. Al van jongs af aan heb ik geleerd engels te spreken. Naar mijn mening spreek ik het dan ook bovengemiddeld goed, maar het is niet mijn moeder taal en er zal dus altijd een taal barrière zijn, hoe miniem die ook mag zijn. De eerste paar dagen op Wolfpark hield ik mij nog wat rustig. Als ik iets wilde toevoegen aan een gesprek, maar het was niet zo belangrijk, dan zei ik het vaak toch maar niet uit angst dat ik vast zou lopen in mijn zin. Al gauw begon dat toch vervelend te worden en besloot ik het gewoon te proberen. Een enkele keer liep ik inderdaad vast in mijn zin, maar dan waren de mensen heel geduldig zodat ik het op een andere manier kon uitleggen. Na ongeveer een week alleen maar engels gesproken te hebben wist al bijna niet meer hoe ik in het Nederlands moest beginnen. Bij enkele telefoon gesprekken naar mijn ouders voelde het vreemd om Nederlands te spreken. Het engels zat er nu volledig in. Natuurlijk is mijn woordenschat niet zo groot als die van de Amerikanen, maar ik wist mezelf altijd duidelijk te maken. Er deden zich enkele situaties voor waarin ik wat zei, niet wetend dat ik een verkeerd woord gebruikte wat weer heel wat anders betekende. Dit bracht wat grappige situaties met zich mee. In de laatste week merkte ik op dat de Amerikanen ook wat dingen fout zeiden in hun eigen taal. Het kwam er uiteindelijk op neer dat ik hen soms liep te verbeteren en soms heb ik hun zelfs een nieuw woord in het engels kunnen leren. Dat voelt goed en is goed voor mijn zelfvertrouwen bij het spreken van engels. Weer terug in Nederland aangekomen, na vier en halve week alleen maar engels gesproken te hebben, viel het niet mee om weer terug te schakelen en gebruikte ik nog steeds veel engels termen. Van sommige woorden wist ik wat het in het engels was, maar kon ik het Nederlandse woord er niet voor bedenken. Toen ik ongeveer twee en halve week op Wolfpark was kwam er een intern uit oostenrijk op het park. Hij was heel onzeker over het engels spreken en zei dan ook niet veel tegen ons uit angst om iets verkeerd te zeggen. Na ongeveer 4 dagen, toen hij meeliep op een tour die ik gaf, heb ik hem gevraagd of hij het van mij wilde overnemen. Met de beperkte kennis die hij had over het park en de onzekerheid over de taal heeft hij het toch geprobeerd. Hij is er snel achtergekomen dat hij de taal beter spreekt dan hij in de eerste instantie had gedacht. Vanaf die dag ging het steeds beter met hem. Hij sprak veel meer en begon al gauw zijn eigen tours te geven en zelfs grapjes te maken in het engels. Ik heb geleerd dat als ik me ietwat onzeker voel over een andere taal dat ik het gewoon moet gaan proberen. Op die manier creëer je snel genoeg het zelfvertrouwen dat je nodig hebt om de taal goed te kunnen gaan spreken. Het bleek dus uiteindelijk enorm mee te vallen, mede dankzij de geduldigheid, het begrip en de complimenten van de mensen daar. Eén van de vele werkzaamheden die ik op het park heb moeten uitvoeren, is het geven van rondleidingen. Om genoeg kennis over het park op te bouwen heb ik de eerste twee weken veel tijd besteed in het lezen over het park en het meelopen met tours van andere. Na de tweede week ben ik begonnen met het geven van mijn eigen tours. Ik weet dat ik met mijn presentaties vaak te enthousiast word en heel snel ga praten. Daarom is één van mijn leerdoelen ook om dit af te leren. Op de eerste paar tours die gaf, moest ik nog af en toe op mijn 'spiekbriefje' kijken en nadenken over wat ik wilde gaan zeggen, dus snel praten zat er al niet in laat staan om te snel te praten. Maar zonder dat ik het doorhad begon ik mijn spiekbriefje al minder te gebruiken en uiteindelijk had ik hem nog wel in mijn hand, maar keek ik er helemaal niet meer op. Mijn kennis over het park was behoorlijk toegenomen en ik kon in vloeiend engels de tours geven. Ik heb nooit problemen gehad met het geven van presentaties en uiteindelijk ben ik het zelfs heel leuk gaan vinden. Ik heb ontdekt dat het geven van tours nog leuker is, vooral omdat je dan echt wat hebt om te laten zien. Bij presentaties in de klas sta je daar en moet je alles aan de hand van sheets en plaatjes uitleggen. Bij tours draait het vooral om improvisatie, als de wolf niet zichtbaar is moet je iets anders bedenken om de interesse van het publiek te wekken en als een wolf speciaal gedrag vertoont kan je het daar over gaan hebben. Improvisatie is voor mij heel belangrijk, vooral als ik vaker tours moet geven is het minder leuk om elke keer hetzelfde verhaal op te hangen. Bij het geven van een presentatie ben je altijd gebonden aan de volgorde die je op de sheets gezet heb, er komt een stuk minder improvisatie bij kijken dan bij rondleidingen in dierparken. De dieren doen nooit hetzelfde, dus is je verhaal ook nooit hetzelfde. Dit maakt een tour een stuk levendiger. Vanwege deze redenen ben ik dus ook heel erg enthousiast geraakt over het geven van tours. En omdat ik de taal nu ook goed beheerste ging ik al gauw wat sneller spreken. Voordat ik te snel zou gaan spreken bedacht ik mij dat ik alle tijd had. Ik was niet gebonden aan 10 of 15 minuten zoals bij presentaties, ik kon mijn tours in de meeste gevallen zo lang of kort maken als ik zelf wilden. Op een dag, toen het heel heet en vochtig was, heb ik op mijn tour slechts 3 van de 14 wolven gezien. Om het gebrek aan visueel materiaal te compenseren heb ik het publiek veel verteld. Aanzienlijk meer dan op mijn andere tours. Ik heb er ook rustig de tijd voor genomen. De gemiddelde lengte van mijn tours was tussen de 45 en 60 minuten. Met deze tour ben ik ruim 90 minuten bezig geweest. Ik heb dus geleerd om rustiger te praten en om de tijd te nemen om te vertellen wat ik wil vertellen. In het afgelopen jaar heb ik opgemerkt dat in veel situaties waar mij iets gevraagd wordt, ik 'nee' denk, maar 'ja' zeg. Ik zou dan eigenlijk iets voor mijzelf gaan doen, maar in plaats daarvan help ik een ander met iets. Ik moet leren om er ook aan te denken dat wat ik in de planning heb staan soms belangrijker is. Ik kwam op Wolfpark en streefde er naar om zoveel mogelijk te doen, zoveel mogelijk ervaring te krijgen. Het maakte niet uit wat voor werk gedaan moest worden op het park, ik vond het allemaal fantastisch en werkte zelfs langer dan van mij verwacht werd. Als ik met iets bezig was en iemand vroeg mij of ik kon helpen, dan maakten ik het werk af waar ik mee bezig was en ging daarna met plezier diegenen helpen. Er hebben zich genoeg situaties voorgedaan waarin ik 'nee' had kunnen zeggen, maar het niet wilde. Een halve dag in de week zou ik niet hoeven werken, zodat ik tijd had om aan mij verslag te werken. Ik vond het zonde om de halve dag niet op het park te werken en heb in plaats daarvan mijn schema aangepast zodat ik gewoon kon blijven werken en toch genoeg tijd had voor mijn verslag. Er was zoveel te doen, te zien en te leren op het park dat ik er zeker spijt van zou krijgen als ik 'nee' had gezegd tegen welk van deze situaties dan ook. Door deze situaties heb ik dus niet de kans gehad om aan dit leerdoel te werken, maar voor mij is het belangrijkste dat ik plezier heb gehad in deze hele ervaring. Plezier heb ik ook zeker gehad en ik heb van geen enkele moment spijt. Soms moet je een afweging maken en ik heb daarin besloten om dit punt later aandacht te geven en nu te genieten van alles wat mij tegemoet komt. Naar mijn mening had ik het op dit punt niet beter kunnen doen. Weedwhacken: het grasmaaien deden we meestal in de ochtend. Overal op het park, zowel het wandelpad als de verblijven van de dieren, waren bedekt met gras. Het groeide als onkruid, dus bijna elke dag hadden we wel wat te maaien. Dit was misschien het meest eentonige werk op het park, maar ik had zelfs hier veel plezier in. Meestal moesten we met de weedwhackers aan de haal, maar soms mochten we ook met de groter gemotoriseerde grasmaaiers aan het werk. Shadecloth: Boven de tribune waar de howlnight gehouden wordt en in enkele verblijven van de wolven moesten we doeken ophangen zodat ze in de schaduw konden gaan liggen. Het was zwaar werk, waar veel organisatie bij kwam kijken (afbeelding 6). Vaak ontbrak de goede organisatie en verliep het geheel een beetje langzaam en klungelig. Het bracht wel grappig situaties met zich mee en we hebben er veel lol mee gehad, maar als dingen echt efficiënt moesten gebeurden dan kon dat nog wel eens een probleem worden door het gebrek aan communicatie en organisatie. Animal duty: Dit werk is het meest geliefd bij de meeste interns. De hele dag is het jou taak om de dieren op het park van water en voedsel te voorzien. Dit houdt in: het verversen van het water drie maal per dag. Twee keer op de dag de meatballs maken en voeren, de ijsblokken voeren en hervullen, het slachten van het hert en het opvoeren van het hert. Op een dag als deze houd je vaak wat vrij tijd over om bij de vossen, singing dogs of puppies te zitten. Deercall: Enkele keren per week wordt Wolfpark gebeld door mensen die een dood hert langs de kant van de weg zien liggen, of er net één hebben aangereden. Deze worden opgepikt door het park en in de vriezer bewaard om later geslacht te worden. Het is altijd weer een uitdaging om het opgegeven adres te vinden en dan ook nog het dode hert te vinden. In het begin rijd je er zo langs, maar uiteindelijk krijg je er oog voor en zie je het dode dier al van een grote afstand liggen. Eén van de keren dat ik meeging op een deercall had er een boer gebeld dat hij twee dode kalven had. Na een half uur zoeken hadden we het huis eindelijk gevonden. Toen we het erf opreden kwam er een puppy (hondje) op ons afgerend en toen we de dode kalven gingen inladen, greep het hondje zich met zijn tanden vast aan het kalf zijn oor en hielp ons trekken. Dit maakte deze deercall toch weer bijzonder. Butchering: Dit is het werk waar ik waarschijnlijk het meeste plezier in had. Drie maal per week moest er een reeds dood hert geslacht worden voor de wolven. Dit werk was niet erg geliefd en daarom was er een schema gemaakt zodat niet één en dezelfde persoon met dit werk werd opgezadeld. Ik vond het echter prachtig werk om te doen. Het is lichamelijk best zwaar en je kan je even 'uitleven'. Ik bood daarom ook vaak aan om te helpen als iemand anders de beurt had om te slachten. Daar waren ze wel blij mee (afbeelding 7). Cleanup: Op zaterdag ochtend is het altijd cleanup. Hier krijgen de interns de kans om in het verblijf van verschillende wolven te gaan, ze te aaien, uit te laten en alle botjes en vleesresten uit het verblijf te halen. Foxtalk: Op vrijdag avond, zaterdag en zondag zijn er een paar foxtalks. Hier geeft een intern een kort lezing over de red foxes terwijl hij of zij bij hen zit. De vossen rennen meestal rond of vinden het leuk om geaaid te worden (afbeelding 8 ). Hier krijgen de bezoekers een goede kans om alles te weten te komen over red foxes. Ik heb zelf dus ook enkele van deze mini-lezingen gegeven en heb hiervan veel geleerd over deze prachtige dieren. Ik heb daardoor nu ook een grote liefde ontwikkeld voor deze bijzondere hondachtige. Giftshop: Tijdens openingsuren moet de giftshop gedraaid worden. Dit houdt in: achter de kassa zitten en entree kaartjes verkopen of dingen verkopen. De lege schappen hervullen en buiten kijken of de bezoekers zich niet op verboden terrein begeven. Ik heb een groot deel van mijn werkuren hier doorgebracht. En ook al ben je niet direct in contact met dieren, het is een ervaring waarin ik veel geleerd heb. Ten eerste heb ik leren omgaan met de kassa, iets waar ik altijd al bang voor geweest ben. En daarnaast heb ik veel met bezoekers gesproken. Ik ben er hierdoor achter gekomen hoe weinig de meeste mensen eigenlijk weten van wolven. Hierdoor ben ik educatie nog belangrijker gaan vinden dan voor ik op Wolfpark kwam. Tours: Elke dag van 13:00u tot 17:00u worden er tours gegeven door de interns. Deze tours gaan rond het hele park en duren 45 tot 75 minuten. Dit is een perfecte manier om spreekvaardigheid te oefenen, niet alleen voor het geven van tours en presentaties, maar ook voor de algemene engelse spreekvaardigheid. Ik heb het nooit erg gevonden om in het openbaar te spreken en nu door het geven van tours ben ik er alleen maar meer plezier in gaan krijgen. Ik voel dat ik iets belangrijks heb kunnen betekenen voor de wolven door mensen (die er bijna niets vanaf weten) over hen te vertellen. Ik hoop dat mensen hierdoor het belang van wolven, maar ook van de natuur en alles wat leeft, gaan inzien en deze met meer respect gaan behandelen. Wolven zijn vaak het slachtoffer van verkeerde vooroordelen voornamelijk afkomstig uit oude sprookjes zoals roodkapje of de wolf en de zeven geitjes. Als ik mensen ervan kan overtuigen dat dit niet de aard van de wolf is, maar dat de wolf eigenlijk een heel intelligent, schuw en prachtig dier is met grote betekenis voor de wereld dan heb ik al een klein deel bereikt van wat ik later wil gaan doen. Crowd control: Tijdens de grotere tours en tijdens de wolf-bison demo is het nodig om een paar mensen als back-up te hebben. Zij houden de bezoekers in de gaten en zorgen ervoor dat er niemand afdwaalt. Normaal gesproken is dit de taak van degene die de tour verzorgt, maar bij de groter tours kan dit niet door één iemand gemand worden. Ik ben op verschillende tours mee geweest als back-up en heb gemerkt dat dit zeer belangrijk werk is. Heel veel mensen begrijpen niet wat voor risico´s een wolfpark met zich mee brengt en tijdens één hele grote tour stak een klein kind zijn hand bijna in de bek van een hongerige wolf. We hebben de ouders altijd heel duidelijk verteld dat zij op hun kinderen moeten letten, maar vaak nemen ze het niet echt serieus en verwachten zij dat wij dat wel doen of dat de wolven niet bijten. Maar ook al zijn de wolven gewend aan mensen, het zijn nog steeds wilde dieren. Anders dan bij honden zit hun wilde instinct nog steeds duidelijk in hen en deze kan er ook niet uit gehaald worden. Een wolf is nou eenmaal geen hond. Bijzonder gebeurtenissen: Op 4 juli (independence day) heb ik watermeloenen uitgehold en gevuld met dingen die de wolven lekker vinden. Dit was ons geschenk aan hen om independence day te vieren (afbeelding 9). Eens in de zoveel tijd krijgen de volwassen wolven de kans om de puppies te ontmoeten, dit was meestal tijdens openingsuren, maar als we niets anders te doen hadden mochten we komen kijken. Dit waren toch wel de mooiste momenten die ik op het park heb meegemaakt, vooral toen de moeder haar puppies weer mocht zien. Een deel van het opvoeden van de puppies is de leashtraining. Hierbij lijnen we de pup aan net als een hond en gaan een stukje wandelen. Door hen dit aan te leren is het makkelijker om hen op latere leeftijd van het ene verblijf naar het andere te brengen. Ook deden we dit regelmatig met volwassen wolven en vossen. Niet zozeer voor de dieren, maar voor ons om de ervaring te krijgen. Zeker eens in de twee maanden organiseert Wolfpark een kids program. De kinderen die zich daarvoor hebben ingeschreven gaan allerlei leerzame spelletjes doen. Als intern hoef je hier niet aan mee te helpen, maar het mag wel als je de tijd ervoor hebt. Ik heb hier ook aan meegeholpen en tot mijn verbazing beviel het mij beter dan ik had verwacht. Dit waren de voornaamste taken van de interns. Verder is hun taak om te doen wat nodig is om het park te runnen. Ook kregen we veel vrije tijd om zelf wat te doen. Op deze momenten konden we tijd besteden bij de dieren en ze observeren of boeken uit de bibliotheek halen en lezen. Op dinsdag ochtend is er meestal een lezing van Pat Goodmann (wolf ethologist) over het gedrag van wolven, maar ook over andere dieren. De dag begon om 7:30am. Ik had vandaag mijn meatball test en ben vroeg op gestaan om de meatballs voor de wolven klaar te maken. Voordat ik mijn test mocht doen met Pat kregen we eerst te zien hoe de dierenarts de wolven hun inenting gaf. De dierenarts komt regelmatig naar het park om de wolven in te enten tegen ziekten als hondsdolheid. Na het inenten heeft Holly ons een film laten zien over wolven en elanden. Ze heeft ons het één en ander verteld en geleerd over de interactie tussen deze twee dieren. Hoe de wolven de zwakste eruit pikken en hoe de elanden vluchten en zich proberen te verdedigen tegen de wolven. Na de lezing van Holly was het 12:00pm en hadden we ons uurtje pauze. Normaal gesproken krijgen de wolven hun meatballs voor 9:00am, maar vanwege het bezoek van de dierenarts was het nogal uitgelopen. Om 12:45pm kwam Pat eindelijk en heb ik de test gedaan. Ik nam de meatballs voor de wolven en singing dogs mee en ben met de rode truck naar de wolven gegaan. Daar heb ik alle volwassen wolven hun meatball en medicijnen gegeven en hun water ververst. Na hetzelfde gedaan te hebben bij de singing dogs en het water van de bizons te hebben bijgevuld vertelde Pat mij dat ik geslaagd was voor de test. Ik mag nu op ingeroosterde dagen al het eten voor de wolven klaar maken en het aan het voeren. Ik heb gelijk de hele dag animal duty op me genomen en heb een enorm hert uitgezocht om te slachten (afbeelding 10). Ik heb mijn butchering record verbroken en heb het beestje in 20 minuten helemaal geslacht. Na het slachten heb ik alle delen van het hert in de koeler gezet en heb ik me gedoucht om de geur van herten bloed uit mijn haar te wassen. Herten slachten is een enorm bloederig en smerig werk, maar ik heb er enorme plezier in en probeer graag mijn persoonlijk record te verbreken. Om 3:00pm heb ik de ijsblokken van de vriezer in de rode truck geladen en heb ze aan de wolven en vossen gevoerd. Toen ik bij de vossen kwam en op mijn horloge keek zag ik dat ik vroeg klaar was met de ijsblokken en heb even wat tijd besteed door bij hen te gaan zitten. Natuurlijk kwam Basil (de wit gekleurde red fox) gelijk om mijn aandacht bedelen. Ik heb een hoop mooie foto´s van hem en de andere vossen gemaakt (afbeelding 11). waar de vriezer en koeler staan en heb de ijsblokken voor de volgende dag klaar gemaakt. Daarna heb ik het geslachte hert in de truck geladen en ben ik weer terug naar de wolven gereden. Het was, eveneens als het slachten, een bloederig karwij om de ledenmaten van het hert over het de hekken van de wolven verblijven te gooien maar ik heb er nog steeds lol in (vooral in het gooien van de ingewanden, die zijn lekker glibberig en zwaar en willen nog wel eens op het hek terug stuiteren en op je hoofd komen). Het enige nadeel is de stank die in mijn kleding en haar trekt waardoor je op zo´n dag de hele tijd naar herten bloed ruikt. Omdat de ochtend meatballs vandaag pas laat gegeven waren heb ik de middag meatballs, die normaal om 4:00pm gevoerd worden, nu twee uur later gedaan eveneens als het verversen van het water. Het was nog best lastig om de wolven hun meatballs en medicijnen te voeren omdat ze het druk genoeg hadden met het verorberen van hun deel van het hert. Uiteindelijk zijn ze toch allemaal naar me toe gekomen en had ik nog even tijd om met de puppies te spelen. Hierna ben ik met de andere stagiaires naar TC´s (de ´stamkroeg´ van Wolfpark) gegaan. Daar heb ik de zeer pittige kippen vleugels met hot dutchman saus gegeten. De vlamen kwamen uit mijn mond, heerlijk. Terug op het park hebben we met zijn allen een wandeling gemaakt naar de oude molen en zijn we ook nog even naar de wolven gegaan waar we ze hebben laten huilen. Dit is inmiddels al de zoveelste keer dat ik letterlijk tussen een troep huilende wolven zit, maar het blijft iets bijzonders. Het gevoel dat het mij geeft is niet te beschrijven. We zijn ongeveer twee uur weg geweest en het was zoals altijd weer dolle pret. We sloten de avond af met een potje kaarten. Morgen ga ik mijn eerste tour geven. Ik heb mijn ´spiekbriefje´ al klaar. Ik heb er enorme zin in. Voor mij was dit de eerste keer dat ik in Amerika ben geweest. Ook was het voor mij de eerste keer om op een dierenpark te werken. Ik heb enorm veel geleerd en heb de tijd van mijn leven gehad. Wolfpark is een fantastisch park. Dit is mede door hoe ze mij hebben behandelt en ook hoe ze de dieren houden. Het belang van de dieren staat altijd voorop. Geld is altijd een probleem voor het park, omdat zij dit niet van de overheid krijgen zijn zij volledig afhankelijk van bezoekers, donaties en interns. Ik ben daarom ook erg trots en dankbaar dat ik heb mogen helpen op Wolfpark. Het is echt een heel goed doel en daar heb ik mij met plezier voor ingezet. Wolfpark bestaat al meer dan 30 jaar en de werknemers hebben dus ook al heel veel ervaring. Natuurlijk gaan er wel eens dingen mis, dat kan niet voorkomen worden als je werkt met dieren. Zij doen nou eenmaal niet altijd wat wij willen dat ze doen. Eén verbeterpunt voor het park zou de communicatie kunnen zijn. Er bestaat een vast rooster voor elke week waar de interns van op de hoogte zijn. Eén keer was er een verandering in het rooster vanwege een feestdag, niemand had ons daarover ingelicht en als we het niet op de website van het park hadden gezien hadden we het nooit geweten. Zo zijn er meer situaties geweest waar wij als interns niks over te horen kregen of te laat wat over hoorden. Ik heb dit aangekaart voor mijn vertrek en heb later vernomen van de andere interns dat het park hier nu aandacht aan besteedt en de interns beter op de hoogte houdt van nieuwe ontwikkelingen. Door het verbeteren van de communicatie tussen werknemers en interns zal veel van het werk dat gedaan moet worden een stuk efficiënter gedaan kunnen worden. Wat ik na mijn opleiding Diermanagement wil gaan doen weet ik nog niet. Door de praktijk ervaring die ik nu heb zie ik diermanagement nu wel anders. Ik zie nu nog meer het belang en de pracht van het vak in. Ik weet dat ik mij wil inzetten voor dieren, op wat voor manier dan ook. Van het hebben van mijn eigen 'wildlife' park durf ik niet eens te dromen, maar door middel van studie en kennis hoop ik veel te bereiken en wat te kunnen bijdragen aan het behoud van dieren, natuur en alles wat erbij komt kijken. Voor mij is de natuur het belangrijkste wat er is en er moet zuinig en voorzichtig mee omgegaan worden. Ik hoop dat ik mensen hiervan kan overtuigen en het hen kan laten zien met eigen ogen. Tijdens mijn vier weken op Wolfpark heb ik meer gedaan, gezien en geleerd dan ik ooit had kunnen dromen. Het is een fantastische avontuur geweest waarin ik veel ervaring heb opgedaan. Ik heb niet altijd evenveel aandacht besteed aan mijn leerdoelen, maar heb ze toch onbewust gebruikt in mijn werkzaamheden. Het omgaan met het taalverschil is naar mijn mening zeer mee gevallen. Het is natuurlijk al iets wat zichzelf ontwikkelt en je kan het moeilijk stimuleren. Het is een kwestie van zelfvertrouwen opbouwen wat mij goed gelukt is. Over het niet te snel spreken in het openbaar heb ik wel even stil moeten staan en tijdens mijn tours is dit mij ook uiteindelijk goed gelukt. Of dit mij ook helpt bij het geven van presentaties weet ik nog niet. Het blijft altijd een probleem voor mij dat ik bij een presentatie een beperkte (korte) tijd heb van meestal minder dan 15 minuten. Ik wil het publiek graag veel vertellen, dan heb ik meestal aan 15 minuten niet genoeg en ga ik dus al gauw te snel praten. Voor presentaties moet ik dus nog even oefenen. Het 'nee' leren zeggen is niet echt aan bod gekomen. In het dagelijks leven, dus ook buiten stages om, komen dit soort situaties regelmatig voor. Ik ga hier zeker aan werken het komende jaar, zowel tijdens mijn studie als in mijn vrije tijd. Ik verwacht niet dat het makkelijk is, maar ik verwacht wel dat ik hier een oplossing voor vind. Het antwoord hoeft niet altijd 'ja' of 'nee' te zijn, het kan ook 'niet nu, maar later wel' zijn. Als ik mijn tijd goed weet in te delen kan ik altijd een middenweg vinden waarmee ik zowel mijzelf als een ander help. Zo wordt een 'win-win situatie' verkregen. Ik heb de afgelopen vier weken zoveel gedaan, gezien en geleerd. Ik ben enorm blij en dankbaar dat ik dit heb mogen meemaken.